We’d love your help. 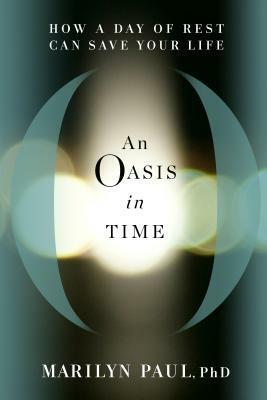 Let us know what’s wrong with this preview of An Oasis in Time by Marilyn Paul. Now more than ever, people are seeking a reprieve from the constant pressure to achieve, produce, and consume. While many turn to sporadic bouts of mindfulness and meditation, organizational change specialist Marilyn Paul offers a complementary solution that is as radi There is a surprising way out of the frenzy, that always-being-behind feeling, and the endless to-do list. To ask other readers questions about An Oasis in Time, please sign up. 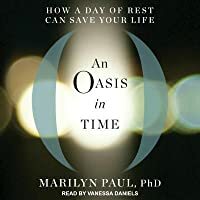 An Oasis in Time: How a Day of Rest can Save Your Life, like It's Hard to Make a Difference When You Can't Find Your Keys is a gentle, good-natured look at human tendencies. But the books couldn't otherwise be more different. It's Hard focuses on STUFF, anything from the paperwork for paying the bills to the laundry, and only refers to time as a tool for organizing. It's an excellent foundation for An Oasis, so you can always find the only worthwhile THINGS that An Oasis examines: snacks, books, An Oasis in Time: How a Day of Rest can Save Your Life, like It's Hard to Make a Difference When You Can't Find Your Keys is a gentle, good-natured look at human tendencies. But the books couldn't otherwise be more different. It's Hard focuses on STUFF, anything from the paperwork for paying the bills to the laundry, and only refers to time as a tool for organizing. It's an excellent foundation for An Oasis, so you can always find the only worthwhile THINGS that An Oasis examines: snacks, books, games, a pair of binoculars for bird-watching, the supplies for crafting... An Oasis examines the immeasurable value of well-spent, task-less, unstructured time. may sound like contradictions, but they aren't, in context. An Oasis is about using time as a source of intense physical and emotional nourishment as vital as food, sleep or water. Dr. Paul advocates purposely dedicating time to play, preferably at least a little time every day, and at least one full day a week. Dr. Paul defines play VERY broadly, as do many researchers - anything which gives you deep pleasure in a refreshing and/or challenging way. It is entirely self-defined and self-directed: for me, writing this blog is play; for someone else, writing a blog could be punishment. Somewhere, someone is careening down a mountain on skis right now, exulting in every second: the closest I've ever come to downhill skiing is the week I spent in a ski lodge in Big Sky, Montana, and that was almost too close. Lots of hot chocolate helped. Dr. Paul draws on profound sources for her arguments, from the millennia-old traditions of major faiths to researchers in the social sciences. More important, Dr. Paul doesn't just make her case and end the conversation. She offers tools for adding play and a day of rest to her readers' routines and concrete, achievable milestones to mark their progress in gaining the new habits. The book is a measure-by-measure look at: (1) the disabling habits most people have adopted in modern society around always being busy and connected to information; (2) how to decipher your habits; (3) how to design and protect your unstructured time, and much more. I loved the idea of creating "an oasis in time", a little piece of heaven in our busy, chaotic lives. Marilyn Paul is a proponent of a hard-core type of oasis: completely unplugged from technology and the economy (so no buying that yummy croissant at your favorite little coffee shop if that's how you typically spend every Saturday morning). And don't forget to ring the bell, and sing while marching around the dining room table banging instruments to signify the beginning of your sacred time away I loved the idea of creating "an oasis in time", a little piece of heaven in our busy, chaotic lives. Marilyn Paul is a proponent of a hard-core type of oasis: completely unplugged from technology and the economy (so no buying that yummy croissant at your favorite little coffee shop if that's how you typically spend every Saturday morning). And don't forget to ring the bell, and sing while marching around the dining room table banging instruments to signify the beginning of your sacred time away from your hustle and bustle. She does, however, admit that her way isn't for everyone. I prefer a more moderate approach, but there were many of her ideas that resonated with me. I took away a couple of tips I implemented immediately, and I've already seen a lovely change in the way I go about my days. I'm a proponent of daily oasis time - even if it's for 20 minutes - especially for mothers of young children, like myself, and other caregivers. I was surprised to see how much of this whole oasis concept I already implement. I'm ruthless with my "me time", and I consider it a non-negotiable form of self-care. Since I was already onboard, I didn't need to be convinced of the immense benefit of taking time to relax, but I can see how other readers may require the multiple chapters Paul spends trying to get us to buy-in to the concept. I tried this because I loved the author's first book, but this one wasn't as impactful for me. It seemed mostly targeted at total workaholics, which meant it didn't leave much focus for those of us who were mostly looking for ways to make our existing leisure time more meaningful. It starts by spending too much time trying to convince its audience of the value of slowing down. As someone who committed to reading an entire book about the subject, turning the page to find yet another chapter tellin I tried this because I loved the author's first book, but this one wasn't as impactful for me. It seemed mostly targeted at total workaholics, which meant it didn't leave much focus for those of us who were mostly looking for ways to make our existing leisure time more meaningful. It starts by spending too much time trying to convince its audience of the value of slowing down. As someone who committed to reading an entire book about the subject, turning the page to find yet another chapter telling me it was a great idea seemed like a slog. I also felt that the book could have been more organized. The same subjects come up again and again in only a slightly different context; I'd have preferred to see a topic raised, expanded on, and supported with examples all in one place instead of popping back up again and again in a more haphazard way. Enjoy Living! *Reason Retirement Choice At 60 Years Is Able Save A "Dollar" In Bank, But Time Is Gone! * Live With INNER PEACE! With A Miserable RUSH STRESS Lifestyle! "Cognitive Therapy Thoughts Beliefs Use As "MANTRAS While Time Alone", And Transformations Positive Enjoy Life ANEW! "Savoring This One Precious Life"
"Live An Awesome Day A Sense Of The Sacred; An Appreciation Gratitude Magnificent Simple Gifts"
To Be Alive; Listen To Breath; Recognition Miracles Blue Skies; White Clouds; Green Leaves, Our Own Two Eyes" Listen Nature! If Your A MISERABLE PERSON! * END IDENTITY BASED On JOB & POSSESSIONS! I won this in a giveaway. I was attracted to the this book because rest is something I crave. When I read a non-fiction book, I always have a notebook with me to record notes. My 5 star rating was granted due to the volume of notes I took. I haven't quite gotten to the day of rest yet but I'm working on it. I grew up with Sunday's being a no work day. I remember stores being closed on Sundays. It was always a day dedicated to family. I have a full time job during the week and I work at my church o I won this in a giveaway. I was attracted to the this book because rest is something I crave. Get started, put it into practice, and take back your time means taking control and carving out relaxation time. The author presents information in an easy to understand language. Readers can implement activities at little or no cost. Appendixes include tips, a guide, samples, rest from a Christian viewpoint, and additional resources. For books lovers, reading the book may be a form of relaxation in itself. Goodreads Giveaway randomly chose me to receive this book. Although encouraged, I was unde Get started, put it into practice, and take back your time means taking control and carving out relaxation time. The author presents information in an easy to understand language. Readers can implement activities at little or no cost. Appendixes include tips, a guide, samples, rest from a Christian viewpoint, and additional resources. For books lovers, reading the book may be a form of relaxation in itself. Goodreads Giveaway randomly chose me to receive this book. Although encouraged, I was under no obligation to write a review. The opinions I have expressed are my own. This is a very important book for our modern addicted-to-busyness age. The author does a great job of explaining the benefits of time away from work (mental, physical, and spiritual) as well as practical information on how to get started. Highly recommended. This is a book that not only made me think about taking a day of rest but also about how I use time the rest of the week as well. The book is not limited to those interested in observing a Sabbath for religious reasons. It makes the argument that taking a day of rest is good for everyone. Very helpful if you want to create Sabbath time and want your family to help! reclaim your time. sabbath, shabbat. slow movement. Frankl: "space between stimulus & response." "time confetti"
Marilyn Paul, Ph.D. is an organization and management consultant skilled in facilitation, organizational diagnosis, systems thinking, and leadership development. The purpose of her consulting is to help people improve their abilities to work together to accomplish meaningful results. Among her strengths is the ability to facilitate a new perspective and original solutions to persistent problems. Marilyn Paul, Ph.D. is an organization and management consultant skilled in facilitation, organizational diagnosis, systems thinking, and leadership development. The purpose of her consulting is to help people improve their abilities to work together to accomplish meaningful results. Among her strengths is the ability to facilitate a new perspective and original solutions to persistent problems. She has a special ability in combining a focus on results with attention to individual growth and team development. She is dedicated to improving the well-being and effectiveness of people working in a wide range of organizations. Over the past twenty-five years, Dr. Paul has worked with people on many different organizational levels from executive teams to the shop floor in manufacturing settings. She works with corporate clients, non-profit organizations, and in government and health care. She works with clients to understand their current realities, develop a clearer shared vision, implement strategy, improve their skills in communication, peer coaching and time management. Her clients have included The Kennedy School of Government, The New York Times, Jobs For the Future and the University of Vermont Snelling Institute for Leadership, Pfizer, the World Bank and Harvard Hillel. She has been a consultant with Innovation Associates, Arthur D. Little, and DIA-logos an organizational learning consulting firm.